The event which is labeled with #66 and called $1,500 No-Limit Hold’em saw the final six players who came back on Sunday to compete for the top award of $323,472. 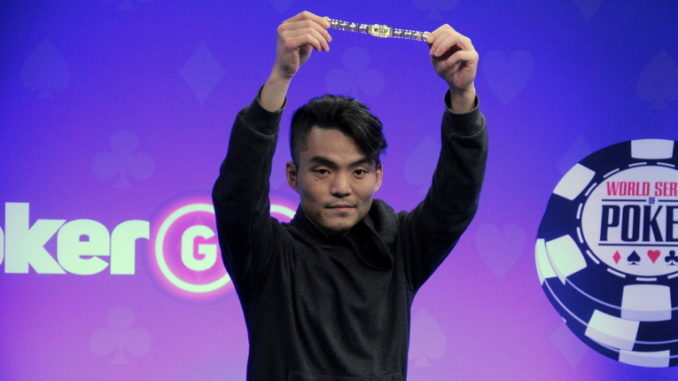 In the end, it was Longsheng Tan who managed to cash out this prize and win his first bracelet ever. The battle was hard, and he had to go through four levels of play. Longsheng Tan is a real estate agent, and poker has been his passion for a long time. He originally came from China, but eventually decided to stay in Las Vegas and make this city his home. Tan stated that when he was busy, he focused only on selling houses, but in his free time, he would play poker. This hobby of his has become a nice source of income for Tan as he already managed to win $562,791 in 29 scores only in 2018, which is quite an impressive result for someone who is not only focused on poker. Tan also had four World Series of Poker cashes in total. His performance during the final day can be described with a metaphor of a very fast car. He was running full speed most of the time and had a perfect feeling on when to hit the brakes and slow down a bit. Tan stated that he did his best and that as long as he was trying and doing his best he would be satisfied with the result. He tries not to lose his calm. This was especially evident when he lost the chip lead, and everyone had the similar amount of chips at one point. Tan admitted that this set him off a bit but that he managed to stay focused and finish the job the way he had started it. Tan ended in the heads-up with Lanny Levine and had a 3:2 lead. The crucial hand happened when Levine decided to go all in when all of the five cards were opened up and showed 9?, Q?, 7?, A?, 7?. With his ten and seven in hand, Levine was pretty sure that this hand would belong to him, only to find out that Tan had an ace-seven. This was pretty surprising for Levine, who finished second in this tournament and earned a total of $199,862. Other players who came back on Sunday to play the final six table are Jayaram Kovoor-Chathoth $142,785, Trey Brabham $103,212, Adam Laskey $75,497, and Stephen Bierman $55,892. It seems that Longsheng Tan is moving rapidly up and his poker game is increasing a lot. Although he did not talk about his future, there is always a possibility for him to completely give up real estate and focus only on his hobby. One thing is certain, however – Longsheng Tan is a name we are going to hear more in the future.